I have moved into a penthouse suite near to the hotel in which I was previously staying. When I say penthouse, I mean it is perched on the flat roof of a house. And when I say suite, I mean it is sweet, well sort of. It is basic to say the least but has a bed, use of all the usual facilities and comes with a tv and wifi. Not only that, it costs just US$300 a month, which is not bad for accommodation in Miraflores. I have mentioned previously, how friendly the local people are, so I was not surprised when, as I was walking back to my hotel after dinner the other night, whilst waiting to cross the road, a young woman politely smiled and said hello. I responded in kind, as I am keen to exploit every opportunity to practice Spanish, and we struck up a conversation. We crossed the road and continued walking and talking until, after a few minutes she asked, “would you like a massage?”. “No thank you”, I replied. “Something else then?” she asked. “Thank you for your offer but no”, I said. “Don’t you think I am pretty?” she asked. “Well of course I do.”, I responded. And she was. Her hand then moved towards my nether regions, “muy grande!” she exclaimed as she accidentally touched the spectacles case that was in my pocket. At this point I became more insistent, finally managing to get her to understand that I was not interested and she switched her attention to a passing hombre. I can’t help wondering what would have happened if the situation had been reversed and I had been trying to grab someone by the spectacles or similar. A night in the cells at least, probably. The sequel to this is that the following day, I was in Kennedy Park in Miraflores, where free wifi is available. I was chatting with my daughter back in England, when a man came and sat nearby. He said hello and I replied. He started to talk about the park and the wifi, during which time I was still chatting to my daughter but not wanting to offend, I was responding to him. He then asked, ” would you like a massage?”. ” No I would not! !”, I replied as assertively as I could. “I am looking for a good time,” he said to me. In English this time. “Well you won’t bloody well get one from me!”, I said, thinking, “If he tries to touch my spectacles case, there is going to be trouble”. But he just got up from the bench and walked away. What annoyed me most was that he switched to English, thinking I had not understood him. I understood only to well but I still enjoy the friendly open outlook of the people here. 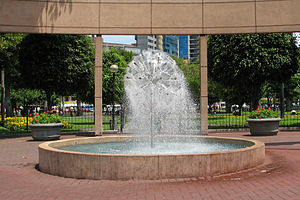 This entry was posted in Miscellaneous and tagged Kennedy Park, Lima, Miraflores, Peru. Bookmark the permalink. I was a bit worried today when I went for a haircut and the barber offered me a massage. He was holding a cut throat razor at the time. Fortunately it was just one of those handheld vibrating massagers and restricted to neck and shoulders. Phew!! I must look as if I need massaging. I wish I looked like I needed money. You should have plucked up the courage before. You have missed your opportunity now.